It’s Now & Then time. I know, this pic isn’t the best quality. Hey, I’ve got the cheapest Epson scanner they make. Want better ones? Buy me a new scanner. Please. Mark sent in this photo of him with his kids. As he put it “The boys are Logan (14) and Sam (6). This mural picture was taken in Kinsley, Kansas, which is EXACTLY midway between New York and Los Angeles. Exciting? BTW. Mark suggested Kansas as a location for our reunion. Please let him know what you think of that idea. Mark also sent in this bonus picture of his wife, Susan, who graduated from St. Stephenâ€™s Academy in Bradenton. So what’s he up to today? Iâ€™m chief operating officer for the 200-bed hospital here in Hutchinson. We lived in the Idaho Rockies for ten years before coming to Kansas. There you have it. A great Now & Then. Want to help me out so we can have more fun? Send me your photos! Server issues. Hello again folks. Some of you may have noticed that the site was down for most of the last day. No one seems to know what happened but it seems to be working now. As soon as I get an update from our committee on the results of their meeting last week I’ll have more for you. Sorry for the problems. 1. After an opening night event of some kind on a Thursday evening, shuttle everyone to Miami for a 3 day Bahamas cruise. The shuttling can be done by bus. 2. Stick to our previous reunion format which has included a Friday and Saturday evening event and Sunday family barbeque. 3. Do something completely different but what? A tentative time frame is in October the weekend before Columbus Day. That would make it Oct. 5 – 8. So we need your input asap. Please comment here or email Nancy. How does that date work for you? Got a better one? What do you think of the cruise idea? If not a cruise where would you like reunion events to take place? How many events should we have? What kind of events? How much should it cost? What’s the limit on price? I’m back and will get “caught up” by this weekend. I’ve got a number of emails to look through and will have more information posted as soon as I can. Hello from Kansas City, MO. I’m going to be a little light on the blog activity until the middle of next week at least so keep on commenting and emailing your ideas and suggestions. I’m at back to back annual conventions and then it’s off to the woods for a couple days (to hide out from the real world). Thanks to everyone who’s visited. Tell others. It’s a word of mouth thing! Wanna Be A Reunion Blogger? More writers for RamsReunion2006. I didn’t think of this before but I can set up user accounts which will let people other than me post their own articles to the blog. I’m open to the idea if you are. I don’t think we want to have too many people doing it for a couple of reasons. Mainly for manageability. I’m going to set Nancy up as one. If you’d like to become a “user” and write your own articles please email me and I’ll get it set up. There are some guidelines I’ll need to provide you with that have to do with things like images but I’m not too worried about it. I’ll still be the blogmaster, which means I have complete control!!!! I just heard from Maryalice Sutcliffe DeCamp (Pennsylvania) for the first time in 30 years. The word is getting around. Comments Off on Wanna Be A Reunion Blogger? So who knows what happened to all the teachers who were there when we were? Do we want to invite them? How do we find them? I see Mr. Sherman was mentioned in the comments too. What was our (affectionate) nickname for him? Sherm the ??? Who are they and do you remember any of them? Feel free to comment and mention others. I know pictures would be good but I’m not in a scanning mood right now. Be nice (or not). This may be a little small but you get the “picture.” Actually Bennie has sent in some photos and this is one of them. Please feel free to submit your own from anytime, including way back when. No date yet for those who have asked. I’m sure that will be forthcoming though. Be patient. Bennie Barton saw my post showing Cindy’s and my picture from on our 25th wedding anniversary so he sent one in from his. Now Bennie, it would help if you gave me your wife’s name! I’ll let you add that as a comment. 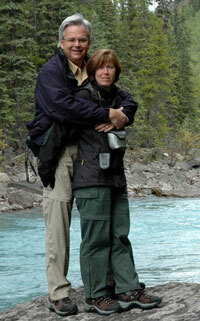 So here’s the Barton’s on their 25th wedding anniversary somewhere in either Canada or Alaska. BTW, I”m sure Bennie will be working on reunion activities according to his email. Bennie’s got an advertising agency in Sarasota which you can find at Marketing By Design. You can email him for all your communications needs. Well the secret is out and now many of you are aware of the blogmonster. I’m certainly looking for ideas and content (pics, etc.). They’ve already started rolling in. I’ll post as I have time. Just wanted to let everyone know that plans are underway for our 30-year RHS class reunion! Please contact me with any questions or with any ideas you’ve got for making this an especially memorable reunion. Also, if you’d like to be involved with planning in some way, let me know that as well. I will be posting frequently here to let everyone know how things are going and what kind of help and input is needed.